← Did you miss Nathan on My Ghost Story? See Segment Here. I get a number of interesting emails through my website. A few weeks ago, I received an email from a filmmaker in Italy named Toni Verita. Toni is working on a series called TalkingHeads, in which he blends poetry, short fiction, music and animated Barbie-esque dolls in short films, and he wrote to ask if I might like to contribute one of my stories to his series. Of course, I was thrilled. These films are gorgeously unsettling, and I was honored to be asked. Although Hurricane Sandy (we were without power for a week) interrupted things a bit, finally, I was able to record my piece “Right Where Mother Left It” and render it into Toni’s hands. You can see TalkingHead 23, “Right Where Mother,” below. It’s about three minutes long. If you like what you see, enjoy more over at Toni’s YouTube Channel at http://www.youtube.com/user/antonioverita?feature=watch. He is also on Facebook. I’m looking forward to working with Toni again in the future—we’re talking about a couple of interesting things, so hopefully they work out. Stay tuned! 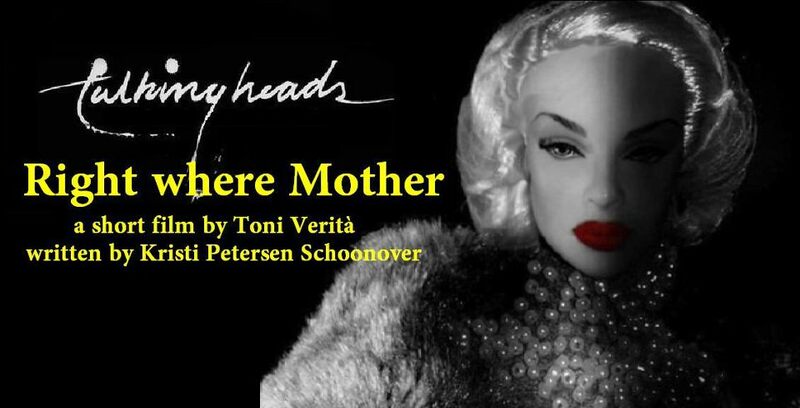 Posted on November 15, 2012, in News, Short Stories and tagged doll heads, Right Where Mother Left It, scary stories short films, Talking Heads, Toni Verita. Bookmark the permalink. 4 Comments. Wow, really enjoyed that one. I love your voice. I was right with you the whole time. Great flick. Did I know you from Goddard/Plainfield? Maybe I’ve heard you read before. Now that is something you don’t forget. I was at the Jan ’04, July ’04, and Jan ’05 residencies, then I left. Then I took a break (doctors told me, “What the heck are you doing in graduate school? You are a low-functioning mental patient and belong in day treatment, not academia. You are so talented at knitting, go join a knitting club.” So I told them I would not go to day treatment. They shook their heads at me, saying, “You aren’t listening to us, therefore, you will never make it.” So I left….and soon enough had transferred to Port Townsend and was doing great. Graduated in ’09. But I left the Plainfield campus for a reason…I think you would totally get the real reason why I left, I told very few people. Were you there when I was? Or had you already graduated? I looked kinda different then and I was doped up. Thank you, Julie! No, I don’t think we’ve actually ever met — I think we found each other on the Goddard MFA Group on Facebook because we were talking about your book. In 2004 and 2005 I was doing undergraduate work at Burlington College. I was on the Plainfield campus in 2007 – 2009, so we would have missed each other. Although we might have known each other’s names if you went to Port Townsend, because I was working on The Pitkin Review at the time you were out there. I’m so glad you were able to transfer and do well at PT! I’ve heard it’s gorgeous there. …and see? Listening to the doctors isn’t always a good thing. Yes, I was in Pitkin once. I did the piece called “Consumers.” Anne Graham Walker, who was a fellow student at PT, was one of the editors. “Consumers” criticized the use of that term for mental patients. I prefer the term “patients.” My piece poked fun of the word “consumers” and said it was a euphemism. There are so many very delightfully and not so delightfully ugly things about being a mental patient and I’d rather just come out and use the word “patient” which is so much more accurate. In the UK, they say “service user.” Not sure about how I feel on that one seeing as it’s so vague. I decided last night (this was rather empowering) that someone needs to know what happened to me at the Plainfield residencies. To use the word again…it was ugly. Nothing to do with the writing program, it was a residency thing. They combined the residencies, the Health Arts and Sciences program with the CW program, so both residencies were happening simultaneously. I got bullied by some of the students in the HAS program. This happened each time I came back. When you were there, were these two residencies still combined? They told me they were going to stop doing this. I was quite vague about what had happened. I think it all flew by kind of and I was so overwhelmed and my self esteem was so low to begin with I never thought that I was “worth it”…so kept mum on the whole thing. But that’s why I never went back, the real reason. I felt beat up inside. I think the director of the HAS program needs to know what happened, even if they don’t have the same director now. I should be more specific: It had to do with food and weight issues and I was on Seroquel, an antipsychotic that caused me to double in size. I was bullied about my weight by mature graduate students who by all means should have known better, in the name of “health.” They pointed to what I ate and put me down for every bite I put in my mouth. I did not even ask them to sit with me. They did this repeatedly and used words like “fat pig,” citing nutritional theories I know now are quite obscure. That was 2005. I went home and demanded that my shrink take me off Seroquel. Finally, I lost weight (over 100 lbs) and swore I’d never again be so badly discriminated against. I developed anorexia in 2008 and I still can’t shake it.